Moving to London for a job? Is your spouse or partner relocating to the UK with you? Perhaps sometimes the planets are in alignment and enable a couple to perfectly time their new London jobs together…so they can move over together and both enjoy job security, with equal enthusiasm over this new adventure together. Very often, though, this isn’t the case. If both individuals are professionals, usually the one whose job isn’t the cause of the relocation is the one who lags behind in finding work again after the move. But it’s not only those accompanying spouses who are giving up a job to move to London that can suffer an emotional setback; even stay-at-home partners are going to trip down their Maslow hierarchy of needs a bit in the absence of a familiar environment and existing family and friend network. In my last post (Part 4), I listed some key talking points that will help couples outline their post-relocation expectations of one another—i.e., what roles they will fulfill after making the London move as far as contributing financially and/or domestically. I mean, these are talks any committed couple will inevitably have whether you make an international relocation or not; the point is, just when you’ve already had this discussion in starting your lives together, moving to London is going to be like pressing a giant RESET button. It probably wasn’t too fun the first time around, and now it’s going to start all over again. Brace yourselves. This is all part-n-parcel of being in a loving relationship, even during (especially during?) those times you don’t particularly like each other! 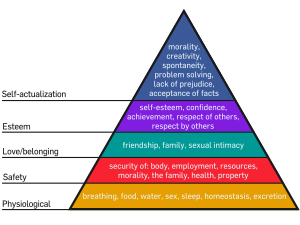 This is the stuff that makes you stronger as an individual and as a pair, so let’s continue rebuilding our Maslow pyramid from the ground-up, shall we? Operation: TEAMWORK. DON’T: Continually blame your spouse/partner for relocating you and argue as if you’re on opposite teams rather than the same one. Continually blame yourself for feeling vulnerable. Isolate yourself and wallow in self-pity for prolonged periods of time. Make no effort to find satisfying outlets for your passions and skills. Hesitate to pursue online networking opportunities or attend local socials. Be shy or ashamed to ask others for help, be it figuring out necessities or seeking counseling. Expect your spouse/partner to be a mind-reader; they have their own preoccupations with stress, too, so might need to be clobbered over the head (figuratively speaking!) with your message. Be unwilling to pull your own weight in some capacity if it’s something you’ve promised to do. Measure your worth by the London occupation you pursue or how much money you make. Forget that you add value in other ways. DO: Take responsibility for your own happiness. Acknowledge that you were part of the decision-making to relocate to London, even if you weren’t the one to initiate it. Observe how the stress of relocation might be impacting your partner as well; they’re bearing tremendous responsibility, too, and may feel worse than you realize that you sacrificed what you did for them (and they may feel unsure of how to properly pay you back for that so go into denial or emotional paralysis mode as a result!). Explore and take advantage of the opportunities a London move will offer (e.g., travel, culture, history, diversity, beauty), even if it means leaving other opportunities behind at home. Get outside and walking around to make the unfamiliar familiar and learn something new. Network with other expats and locals to make some friends—other accompanying spouses make for free therapy :). Reassure yourself that stepping outside your comfort zone is key to personal growth. Let yourself enjoy the luxury of a life of leisure (if you’re not working and even if it’s only temporary)—you’ve surely earned it! Be open to new opportunities, job or otherwise. Feel satisfied and proud that you’re capable of sacrificing so much to support the needs of your spouse/partner. Remember that you did it because you love them and it’s the Golden Rule. But also know that your feelings are TOTALLY validated!!! So be clear in communicating your needs, in a calm, clear, and productive manner. In Part 3, I’d described layer-by-layer how my personal hierarchy of needs had been dismantled by my London move. Rebuilding my own pyramid was not simple or fast, but it definitely helped when I’d come to realize the above and follow my own advice. A person’s life is a complex thing to get into, but I can at least say in brief that finding employment with London Relocation (which I discovered through a posting on Craigslist, FYI) may not have seemed a logical career step for an English teacher, but it was a big step toward returning routine to my day and restoring interaction with colleagues who then became friends. It also allowed me to draw from my teaching background in educating fellow expats on London and offering them empathy and compassion. My social media efforts on behalf of London Relocation also opened my eyes to online networking opportunities, something I’d have never considered at home but truly appreciate now. It was through the social network I created, in fact, that I met the phenomenal group of friends I now hang out with all the time. And my role with the agency has since evolved into writing web content on a freelance basis to allow time for another freelance opportunity that since came my way: editing novels for publication. I’d become an English teacher, folks, because of my love for reading, writing, and helping others, all of which I’m able to do again now in my new capacities, opportunities that I love and would have never gotten to do had it not been for moving to London. Combine that with more time to travel, indulge in creative writing of my own, frequently visit the home I love, and the fact that London is a literary-geek-like-me’s paradise, and I’m finally able stand atop my Maslow pyramid and enjoy the view. Funny how life works out, huh. But like I said, it didn’t come easily nor quickly. I had to play my part in making it happen, but my husband also had to play his—our mutual support has been integral to keeping us both happy. I’ll wrap up in Part 6 the corresponding do’s and don’ts for those who initiate the relocation, such that they fulfill their end of the obligation in keeping their accompanying spouse/partner’s needs met.